We sat down with TMNT co-creator Kevin Eastman and got his take on the big changes in the new film. M&F: You’re used to seeing so many different interpretations of the Turtles over the years, but how did you feel about the fact that they were bulletproof in the new film? It seemed like that would eliminate the need for them to be ninjas. Eastman: The director of the new film, Jonathan Liebesman, who is an awesome director, I think he did an outstanding job of pulling the picture together and doing what he did. There were things like that [being bulletproof]—that we think we could of done a little bit better or a little bit differently as we were trying to bring the turtles into a more contemporary setting, to use a Hollywood term. It seemed to fit the style of the story they wanted to tell. It’s not exactly what I would have done, but I didn’t think it was a huge mistake. It’s tough. You know, growing up, my favorite superheroes were Batman and Daredevil—more down-to-earth superheroes. Superman for example—the fact that he was bulletproof and can do can all of the things that he can do—that suspended my sense of reality of what a superhero would really be like. So when you go in that direction like they did with the new film, you have to make the bad guys bigger and badder and more evil with all these different weapons. M&F: So I guess you would feel the same way about the super strength they had. You kind of get that in the opening scenes where they’re tossing the shipping containers around. They were almost like four miniature Incredible Hulks. Eastman: That’s funny; when we came up with the idea for the radioactive ooze that transforms them into mutants, it was so much like the comics that inspired us as kids. The Incredible Hulk is exposed to radioactive elements that made him the Incredible Hulk. The Fantastic Four were exposed to Cosmic Rays that changed them into the characters that they were. None of that has ever been properly defined—how that was actually accomplished. That includes the Turtles. We just had this radioactive ooze that turned these poor little turtles into these mutant teenage characters. And we’ve tried different variations of the Turtles—“What if?” stories, things like that—where we had them get stronger, regenerate. Even back in the first movie, a lot of the fans were really up in arms when we had the turtles pull their heads inside their shell. But with that type of context that we came up with for that first movie, I felt it worked for the story that everyone wanted to tell. So yes, the super strength might not ambe exactly what I would have done on a number of levels, but at the se time, I thought it fit the story very well and I’m proud of the movie and how it came out. M&F: What’s one thing that’s happened over the years where another creator came up with and an idea for the Turtles that made you say, “Wow, I wish I had thought of that.”? Eastman: Working on the original movies, we had a number of different artists that had a lot of fondness for the Turtles that have done stories that we thought were interesting. They would see things in the Turtles that we never thought about—nuances in their personalities. Michael Dooney was a writer/artist that did a series of the Turtles where he took the more realistic look—which looks very much like the Turtles in the new movie. We quite liked that version of it. Today I would say although I loved each variation and each nuance of every version of the Turtles, the Nickelodeon animated series was hands down my favorite. The reinterpretation of April the character, the variations on the origin, splinter being much taller as opposed to much shorter; we always had him as this Yoda-like character. It brought the Turtles back for a new generation, and that has been incredibly exciting to me personally. This new movie still has got the same heart and soul. It’s got the comedy, the pieces of humor, and a bit of edge, a bit of darkness. So that was really pleasing because I was really worried about it when it initially came out—that it wouldn’t be embraced by the original fans. To think that we’re still out there discovering new fans year after year, it’s just mind-blowing to me. M&F: It is cool to hear you say “we”—did you get to talk to Peter Laird about this movie? Eastman: Not really. I’ve always referred to “we” because without Peter Laird there simply would not be the Turtles. We sat in a room together, 31 years ago in 1983 and we threw around this really crazy idea that grew into the Ninja Turtles. So I do always refer to it as “we” because without Peter there would be no Turtles. M&F: Where would you like to see the sequel go? Would you like to see Dimension X? Would you like to see Krang? Eastman: Almost exactly that. I think with the direction that we took them in was to almost reintroduce the characters. The April story, how she helped the Turtles come to be, is very much like IDW comic version that we/I have done for the last few years. But we wanted to introduce the characters, set up a theme and tone. But I want to see more—more mutants. I would love to Krang, of course, and would love to see Dimension X. I think we could have a lot of fun and tell some really great stories with that. 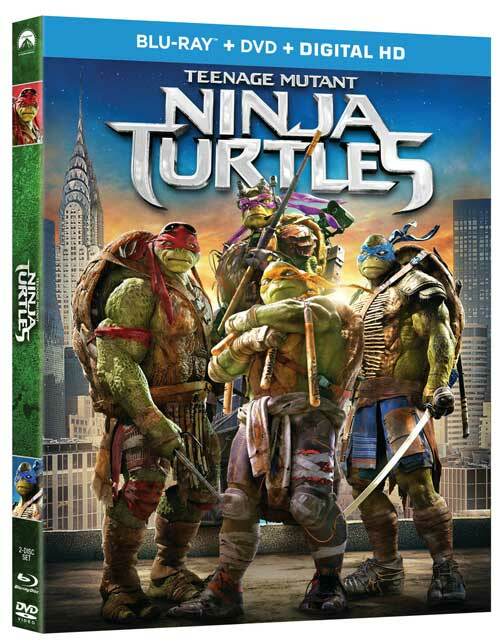 Teenage Mutant Ninja Turtles, starring Megan Fox and Will Arnett, is available on Blu-Ray + DVD + Digital HD Combo Pack everywhere now.